“Aruba, Jamaica ooo I wanna take you / To Bermuda, Bahama come on pretty mama…” Aruba, the last new island we would visit, was our Christmas Day stop. The landscape of Aruba is arid, dry, … and beautiful. 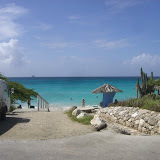 We took a tour with a funny and entertaining driver who showed us around the island, and we also explored on our own. We arrived early and left near sunset so we had plenty of time to explore the island.